Discussion in 'Mapping Questions & Discussion' started by rasterwerk, Mar 26, 2011.
first of all: Great site. I started playing with Hammer yesterday and read through a lot of tutorials and tips: Awesome. I've been doing the Roof-Tutorial (Valve Style) and built a simple barn with an adjacent shed. I've came up with some questions which I couldn't answer via searching, so if anyone'd like to help me that would be much appreciated. 1. I've built a ground using displacement, but there's some strange geometry around it (No. I). I suspect it's because i've used a block to make the ground. Is there a way to make a plane without thickness? 2. A small part of one of the roofs has completeley blurred textures (No. II), regardless of which texture i chose, what could that be? 3. 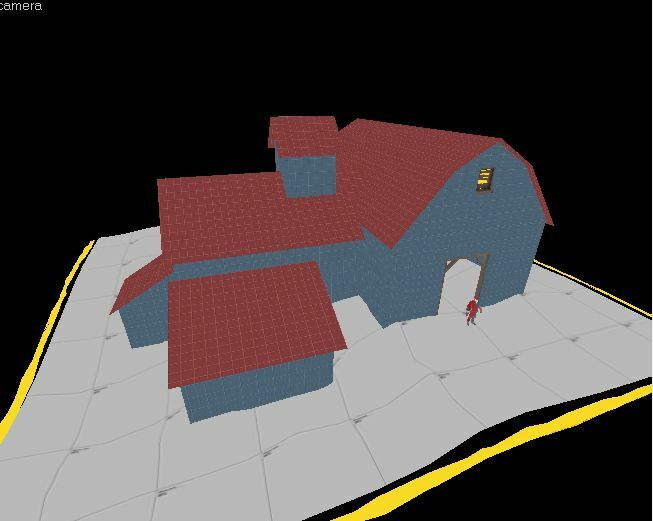 The tutorial explained a workflow in which you end up with a roof above an (invisible, nodraw) roof (No. III). What's the use of that? 4. I tried making roofs without the second roof and it still looks alright (No. IV). 5. I've just loaded my map and there are six solids missing (No. V). Bummer! These are all triangular shapes, which I used to create the roofs. However at the main Barn, the same shapes are still available, I wouldn't know what I did different on them ( I used the vertex tool in the creation of all of them). /Edit2: Solved! After some further testing it seems that for some reason I didn't merge the vertices, so 2 vertices were on top of each other, rendering the brush invalid and useless. This also might explain the blurry texture. First thing make sure and are unticked in the top right of Hammer. That will make it so your textures align correctly and that you won't have to go and correct them yourself later (for the most part). Secondly, simply recreating the blocks from scratch will fix those invalid solids. When you directly copy a 3 sided shape it sometimes makes the copy an invalid. It's not a big deal though like I said. Delete, recreate, profit. About your displacement question. Create a single block of nodraw then only texture the sides you want to be shown (Usually the top, ala ground). When creating the displacement only have the top selected, then hit create. Keep your power between 2 ~ 3. Hardly EVER will you have a practical use for 4. Hello Vincent, thanks alot. So the copying/flipping was probably the problem? Interesting. 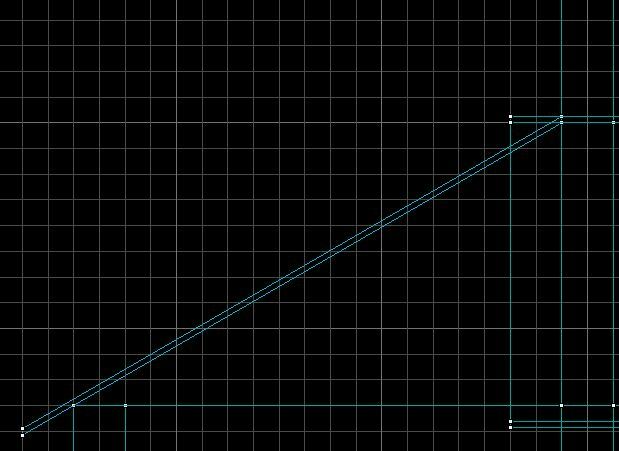 Also thanks for the hint about only selecting the top face when applying displacement, that's what I needed! 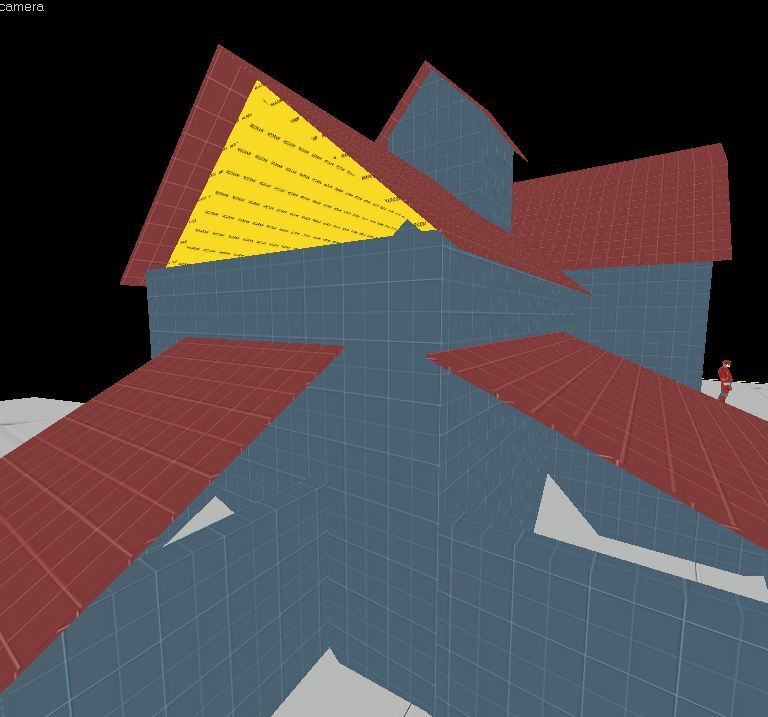 So the basic idea of creating the roofs like that is to make the world geometry as simple as possible. Brushes can be world or entity, world brushes cut vis, entity brushes do not, which is why you use func_detail on the thin slabs of roof. What is meant by "cutting vis" is basically the empty space that the player moves through gets chopped up and the simpler those chops the better. But you don't have to do the roofs exactly like that, there's a few different ways, but doing it that way will yield fewer triangles. Essentially the whole point is that you dont want the thin overhangs to be world brushes, because they create those vis cuts in empty space. For the blurred face, when that happens the problem is that the texture isn't being projected properly. Select the face in the texture tool and click the "world" or "face" checkbox. If you see that problem and press Alt+P (check for problems, which is an imcomplete error checker fyi) it will probably say something like "Texture Axis Perpendicular to Face"
Not sure I see what you think is wrong in the first picture with the ground. Okay, I now understand what the difference between world brushes and func_detail plus the concept of cutting vis. I still don’t understand the thicker roof beneath the thin func_detail roof though. It’s nodraw, so it won’t be seen, right? 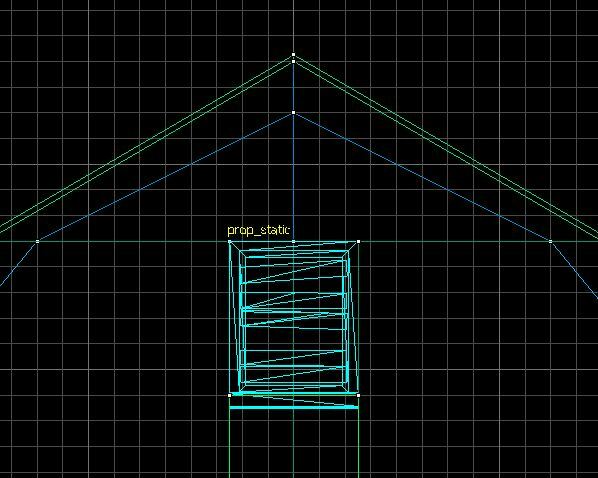 Or am I supposed to make the down-facing face of the thicker roof visible, so the roof looks nice from the inside (showing one face of the thicker roof, clean geometry) and the outside roof is not cutting vis outside the house? Am I on to something here? I apologize if I wrote confusing, I’m not a native speaker. Edit: Ah the ground was about the yellow stuff around it (jerky geometry, I nodraw’ed it). But Vincent explained to me that the error was to have the whole block selected for displacement and not just a face. The down-facing face of the inner roof should be visible. 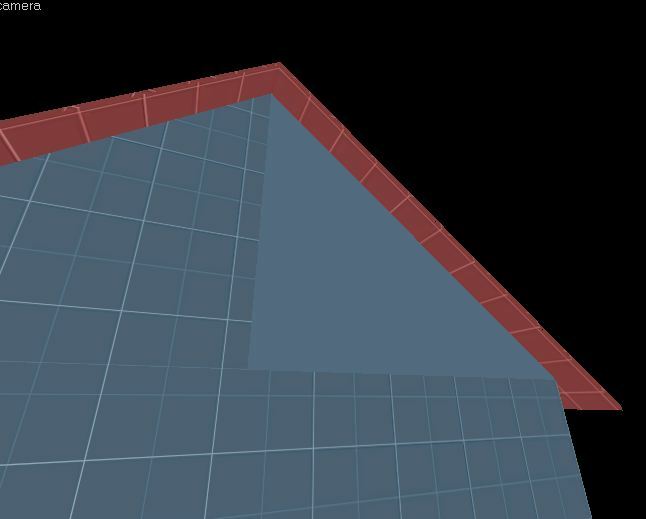 This brush is solely to stop vvis thinking you see into the building from outside, while keeping the building's shape simple. So it is as I suspected. Pretty clever technique, actually. I’ll probably have a ton to learn if I'm serious about mapping. /Edit: All my questions are answered, thank’s a bunch.